« Did Iran Just Try to Smuggle in a Tiger in a Suitcase? If you live in the eastern U.S. chances are there’s now a purple martin festival or fan club nearby–or will be soon. Watching and attracting America’s largest and most co-dependent swallow has become a big pastime and $30 million business. About a million Americans have put up housing for purple martins, says Louise Chambers, the Education Outreach Director for the Purple Martin Conservation Association. Some people do try to chase the martins away–and decades ago even killed them mistaking them for starlings, Chambers says. In 2007, the last year figures are available, the USDA’s Wildlife Services, the federal agency for killing what’s considered nuisance wildlife, chased away 625,720 purple martins, mostly in Mississippi and Kentucky, and killed five. By now most Americans think of martins as something to enjoy, not shoo away. About 125,000 Americans a year try to because what martin lovers adorably call landlords: they put the distinctive white houses or gourds. A recent New York Times story highlighted martin mania and how some fans will set up nest cams, band birds and even dig ponds to attract more birds. Most people don’t succeed in attracting martins, Chambers said, mainly because they set up the house in the wrong place–too close to trees or buildings. Martins want a big, open flyway to feel safe. The Association has mentoring programs for landlords, detailed instructions on their site and the focus of many festivals is really to show people how to bring in the tenants. If you don’t set up the house correctly, says Chambers, you run the risk of attracting “just house house sparrows and starlings, two of the worst enemies purple martins have,” she says. Not only do they usurp housing, these non-natives will actually kill young martins. The festivals used to be just small affairs by big landlords, says Chambers. Now towns are getting in on the act. The festivals in spring and early summer celebrate nesting season. The ones in late summer and fall are something else entirely: they’re to see giant swarms of swallows that roost in one area at night. Nests are only for raising young. The swarms are so big they can be seen on radar. The association has compiled a really neat map so you can try to find a swallow swarm near you. “You dont have to be a martin fan or even a bird lover to like seeing 100,000 martins,” says Chambers. “It’s a spectacle.” The swarms also make for civilized, convenient birding because you don’t have to get up at some ridiculous hour. The roost watching parties are known to have purple martinis. 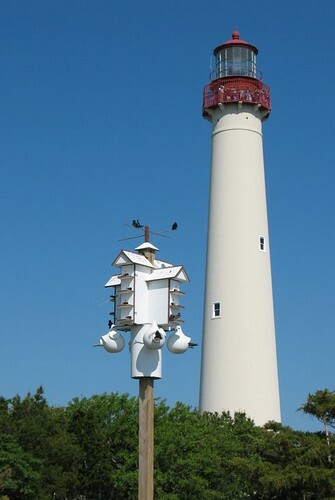 St. Matthews, SC, has been hosting a purple martin festival in May since 1973. Purple martin fans, along with help from the Rotary Club, have installed ample purple martin housing. They even have a purple martin song and an adorable purple martin mascot. Maurice Township has an annual celebration of the8,000 or so purple martins that live near thecauseway bridge of Country Road 670. You can see them on special trips by kayak or boat. NJ.com says its the work of Citizens United to Protect the Maurice River and Allen Jackson, a retired USFWS biologist. Bonus species: bald eagle (especially in winter), fall waterfowl migration, including teals. Purple Martins nest in the Mason-Dixon Park, which sits on the PA-WV border near Mt. Morris. The park has a festival in June with the help of Ralph Bell, a licensed bird bander. In addition to watching purple martins, you can learn about banding and becoming a purple martin landlord. Ft. Myers has a huge purple martin colony nearMain and Hendry Streets. The nearby Bar Association Restaurant has watching party in late July at dusk. So much more civilized than the usual pre-dusk birding gatherings. Camrose, Alberta, has a June festival for purple martins (and other wildlife) at the Stoney Creek Centre (also called the Four Seasons Environmental Centre). The festival is part of a project to encourage purple martins. Massachusetts only has a few pockets of purple martins, but the Parker River National Wildlife Refuge up by Ipswich is a hot spot. Rangers lead tours to Plum Island in June.